Today has not gone as planned. That's not to say I haven't been productive, or that I'm not proud of the work I produced today. It is to say that I planned my day to the minute, but the execution did not work out. I blame bad math. In actual fact, of the dozen or so tasks I had on my list, I only got about half of them done. And most of that was before I took a lunch break. Since coming back from lunch, however, my plan tanked. Two of the tasks on my list took way more time than I had allowed for them. Which is why it is almost 9pm and I'm only just writing this post now. I had a plan for tonight's post too, but it involved research and planning. It was a doozy of a blog post... But for now you will have to live with this one. And so will I! Yesterday a friend posted this infographic on Facebook and I really took it to heart. 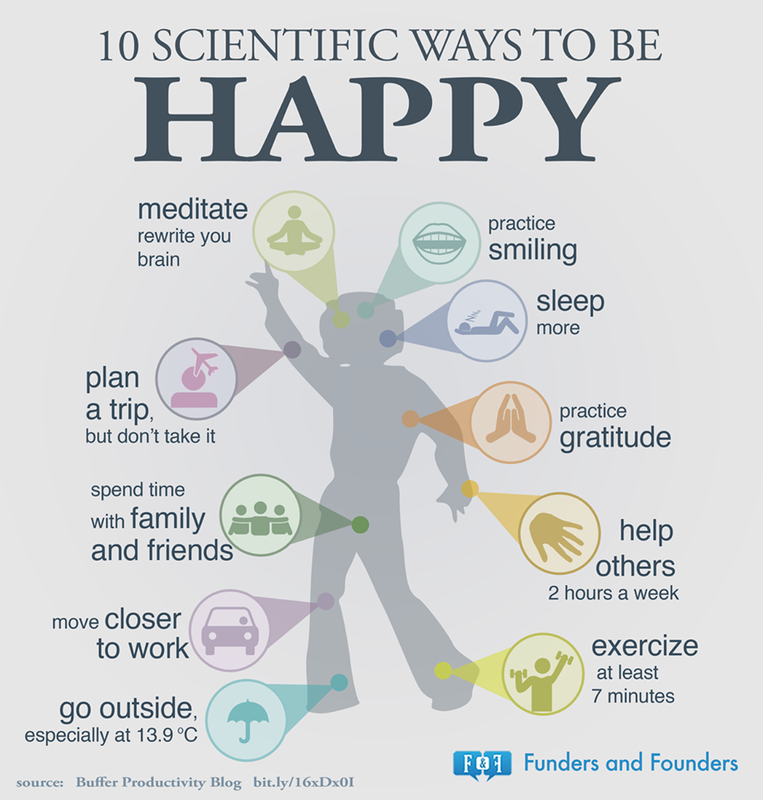 Of the 10 items on this list of simple things to live a happier life, I've enjoyed 8 of them today. I woke up after a great night's sleep well rested and ready to go. I got more than 7 minutes of exercise, outside, enjoying my commute from my home office to my man's home office. And despite the science which says 13.9C is the happiest temperature, I really, really love temps well below zero. This is my happiest season. I regularly give time to not for profit organizations (see my In Service - The Series posts), and this morning's highly productive start included a number or tasks for those organizations. I took a lovely (and slightly long) lunch break with my man, and practised smiling with the owner of the restaurant, the smiley Bobbi. And I practiced gratitude by being thankful for a number of friends who helped edit my work today. I will also add my own personal thing to the list, which is to forgive myself for not getting everything done. Choose to be happy. Everything else is a bonus. I consider tha these scientific ways really work. You shoud relax from time to time and let customessay-s.com does boring writing work instead of you!